Bethana Jones was a prosperous farmer, matriarch of a sprawling family that knit all of southern Nash and western Wilson Counties’ major free colored families, including Joneses, Blackwells, Powells, Evanses, and Locuses. 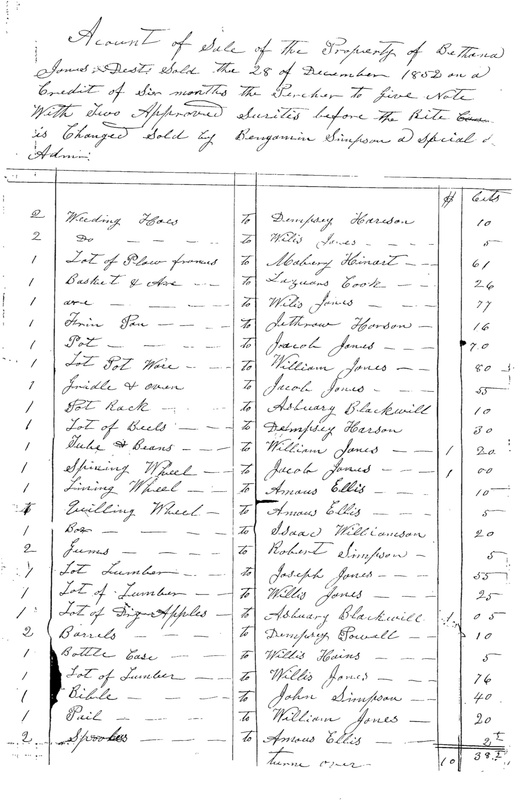 Kinsmen purchasing goods from her estate included Willis Jones, Jacob Jones, William Jones, Asberry Blackwell, Dempsey Powell, Shadrach Jones, and Joseph Jones. This is the first page of three. Estate Records, Records of Wilson County, North Carolina State Archives.